I see a lot about copyright when it comes to quilting. 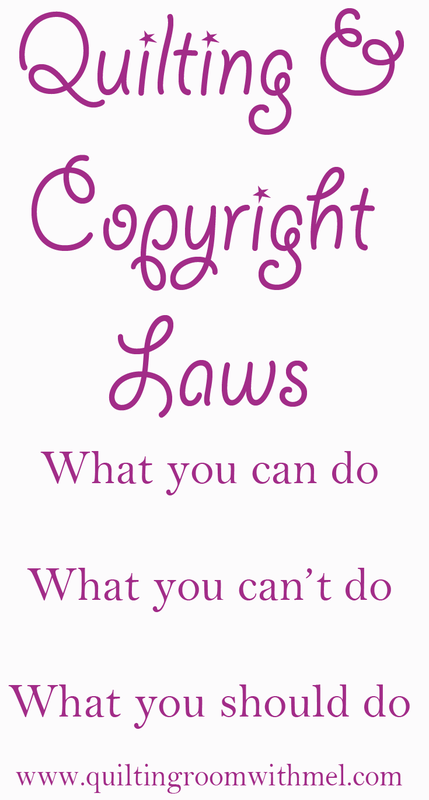 Some don't think there are copyright laws and some do. Others don't understand what can and can't be done. I'm not an expert nor am I a lawyer. 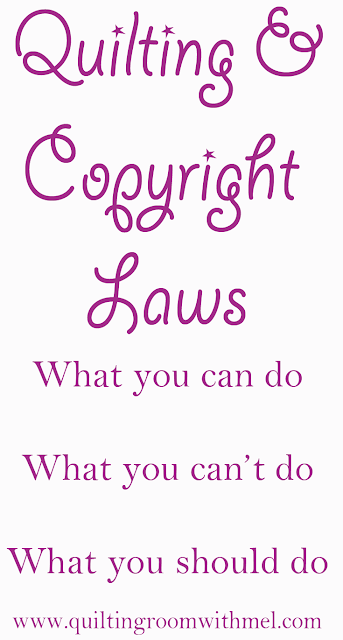 I have references that I have linked to and know that copyright laws are always changing. The best rule of thumb is if you don't know don't do it. Or if you would be upset if someone did it with one of your quilts or patterns don't do it with theirs. Before I started this blog I wanted to know what I could do and what I couldn't do. I also wanted to know what I could do with any quilts I designed. That was a rabbit hole if there ever was one. A lot of the information out there didn't ring true with what I knew. I've spent a lot of time learning about copyright laws dealing with photography so much of the information left me scratching my head. Many quilt designers want you to think that all you can do with the pattern that you purchase is make it for yourself and never show it to anyone. That's not true. So let's break it all down. What can I do with the physical pattern? You can make copies for your own personal use. I know I like to mark on my patterns but I don't want to ruin the original so I'll make a copy and put all my notes on there. I'll mark what colors I'm using. If a pattern has multiple sizes I normally mark out any info that belongs to the other sizes so I don't get confused. You can sell the pattern as long as you don't keep a copy for yourself. What can't I do with the physical pattern? You can't make a copy of the pattern and give it to your friend, your guild, your blog audience or anyone else. You also can't post the detailed instructions of that pattern in a public place or to anyone else. It's not OK for me to buy someone's pattern and then tell you everything you need to make that quilt. Why can't I teach someone how to make the pattern? You can. The thing is that everyone you are teaching needs to own the pattern. You can't require someone logging onto the internet to purchase the pattern before viewing your tutorial. I can teach, for example, one of Bonnie Hunter's patterns to a local group as long as I require everyone in my class to purchase the pattern. I can't teach the pattern on my blog though because in order to teach I have to give measurements and that's violating Bonnie's copyright. Did you pay someone to teach us the log cabin block? Nope. The block is public domain. I can't copyright that and no one else can either. The blog posts though are copyrighted. In those posts I give you the measurements you need, the amount of fabric, and my way of putting it all together. You can share my links, I'd love that, but you can't copy my info and call it your own. I made a quilt what can I do with it now? Whatever your little heart desires. You can photograph it and share those pictures. You can enter into a contest, as long as the rules say you can. You can sell it. You can give it away. You can toss it in the trash. Please don't toss it though! What can't I do with the quilt? You can't claim the design as your own. If you are asked you need to be truthful about who designed the quilt. Give credit where credit is due. This includes your quilter. Many patterns from quilt designers say explicitly that the items made from the pattern may not be offered for sale. Certain fabrics with copyrights, i.e. Disney, Green Bay Packers, etc. are also listed as not for use as items to make to sell. I've read myself blue over the laws pertaining to end-use, but even if you believe you have the right to do it, a law suit is pricey. I've seen people shut down quickly. One key may be in the way you advertise your item. I think this is a very grey area, and not every quilt you make is legal to sell. Just be careful. Thanks for the common sense summary!! 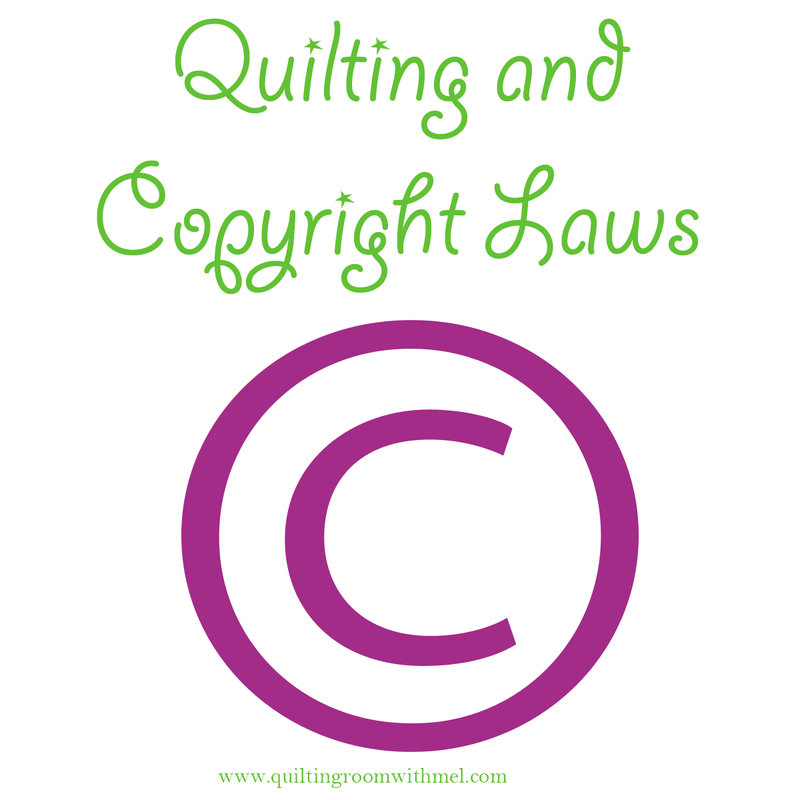 Great advice for copyright laws and quilts! Julie-A designer attempting to extend the protections of copyright laws by adding language doesn't actually change the law. It is explained in some of the links here. They only get the protections outlined by the law, unless they get you to sign an agreement in writing saying you won't reproduce the item for sale. Clicking a box on a pop-up is proving to not be sufficient even for software developers. Authors want to restrict use but really have no legal standing to do so.